Mustard seeds have been used as food and medicine for centuries. They come from the plant with the same name and can be prepared in a multitude of ways. Dijon mustard, American yellow mustard and honey mustard are among the most popular varieties. The health benefits of mustard are due to its anti-microbial, anti-diabetic, anti-inflammatory and analgesic properties. This popular condiment not only enhances food flavor but also provides essential vitamins, minerals and healthy fats. It's an excellent source of omega-3s, phosphorus and magnesium, among other nutrients. One ounce (or 2 tablespoons) of yellow mustard has only 18.8 calories and delivers 13 percent of the recommended daily allowance (RDA) of selenium, 6 percent of the RDA of manganese, 2 percent of the RDA of calcium and 6 percent of the RDA of thiamin. Its vivid yellow color comes from turmeric. According to a 2016 study published by the University of Manitoba, mustard contains phenolic compounds and other phytonutrients with antioxidant and antibacterial properties. Its seeds are rich in plant sterols, fatty acids and carotenoids as well as vitamin E and B-complex vitamins. Traditionally, mustard seeds are used as a natural remedy for constipation, arthritis pain and muscle spasms. Some people use the oil extracted from the mustard plant to stimulate hair growth. This condiment may help in the management of diabetes, heart disease and inflammatory conditions, according to Drugs.com. However, more research is needed to confirm its therapeutic effects. Like other plants in the Brassica family, mustard seeds are high in glucosinolates. After processing, these antioxidants are converted to sulfur-containing compounds called isothiocyanates. A 2016 review published in the International Journal of Molecular Sciences points out that isothiocyanates protect against oxidative stress and inflammation. These plant compounds may induce cancer cell death and prevent cardiovascular and neurodegenerative diseases. Yellow mustard also boasts large doses of selenium. This mineral exhibits antioxidant properties, supports DNA synthesis and may reduce the risk of cancer, according to a 2014 review featured in the journal Radiation Oncology. Furthermore, it has been shown to offset the side effects of radiotherapy in cancer patients and improve their quality of life. Potassium contributes to the health benefits of mustard. This nutrient is required for normal cell function and regulates blood pressure. Low potassium levels in the bloodstream may increase risk of hypertension, kidney stones, electrolyte imbalances and cardiovascular problems. Read more: Does Eating Mustard Help Lower High Blood Pressure? How Is Yellow Mustard Made? Yellow mustard ingredients vary from one brand to another. In general, this condiment is made with yellow mustard seeds, turmeric, salt, white vinegar and spices. Manufacturers often add paprika, garlic powder, cumin, cayenne pepper or honey to boost its flavor. Some also use honey or maple syrup, which increases mustard calories. Read more: What Is the Difference Between Dry & Prepared Mustard? Turmeric, one of its main ingredients, exhibits powerful anti-inflammatory properties. According to a 2016 research article published in BMC Complementary and Alternative Medicine, this popular spice protects against liver damage by suppressing hepatic oxidative stress. As WebMD notes, turmeric may also relieve depression symptoms, improve blood lipids and reduce osteoarthritis pain. The yellow mustard available in stores is often processed and contains additives that may harm your health in the long run. Consider making your own mustard at home so you can fully reap its benefits. You need only a few tablespoons of crushed mustard seeds, a pinch of ground turmeric, vinegar, salt, water and fresh herbs; for extra flavor, add white pepper, chili flakes and other spices. Enjoy it with meat and fish, mix it into sauces and dips, spread it on sandwiches or use it as a substitute for salad dressings. 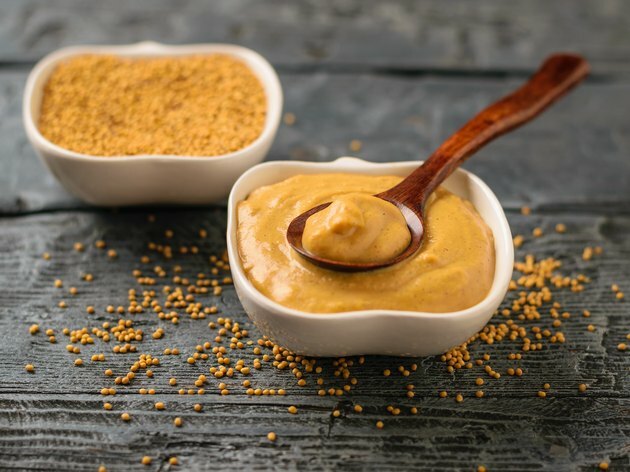 What Are the Benefits of Mustard Powder? What Is the Difference Between Dry & Prepared Mustard? What Can I Substitute for Yellow Mustard in Cooking? What Are the Benefits of Mustard Oil Massage?